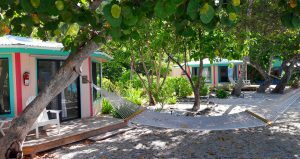 Situated on White Bay, right next to the historic Soggy Dollar Bar, this little hideaway is perfect for a week on Jost. Escape, unwind, and truly refresh yourself with a getaway to Sandcastle, a small resort in White Bay on the island of Jost Van Dyke (British Virgin Islands). Set on one of the most beautiful beaches in the Caribbean, a stay at Sandcastle is the cure for the busy, modern life. Small, friendly and laid-back, Sandcastle offers you the barefoot retreat in the Caribbean you’ve always dreamed of. Walk on our sparkling white beach, snorkel our stunning reef, trade stories at our beachside bar, hike the hills and valleys, or lie in a hammock under a palm tree with a good book, serious relaxation is what Sandcastle is all about. To ensure your peaceful escape, our guest rooms are phone and television free. When you visit Sandcastle, you will experience the Caribbean from a perspective that no other place can offer — fabulous beachside views of the Virgin Islands, an island community of 250 people to welcome you, and a casual attitude that makes no demands. Come join us!